Tulou are circular clan houses made from rammed earth, found in SouthWest China. They are supposedly very strong with very thick outer and inner walls (up to 3 meters/10ft), made from rammed earth mixed with all types of ecofriendly stuff (straw, dung, rice-jelly, etc...). Architects say the buildings are highly energy efficient. They require hundreds times less energy to build than comparable buildings from modern materials, they rely on local materials, and once they're ready, they have very good thermal properties (retaining heat in winter, and cold in summer), cutting energy bills. They last for centuries, through major earth quakes. Now given their form, it would be easy to build these clan homes in an automated way, cheaply and rapidly (e.g. in countries that want eco-conscious houses, and also in developing countries, because they would be quite cheap to make). The machine is a simple set of two hydraulic hammers that ram the earth and biomass materials into a mold; the machine's arm moves in a circular manner and moves up as the walls progress. [See picture, with images of real tulou]. Floors, stairs, windows, doors and the gate would of course be constructed manually; once the building with its massive walls is erect, you remove the machine via the main gate. And move on to build a next tulou based on local earth! + i like helpful things, i've been to several countries in south east asia which would benefit from the use of this. 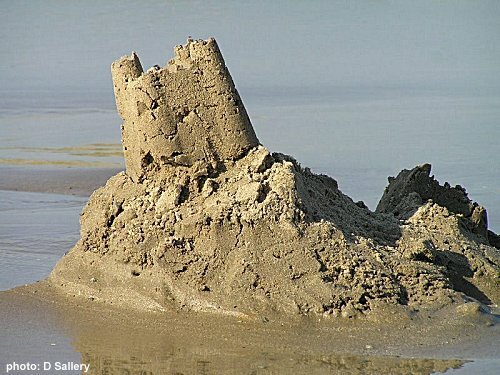 "They require hundreds times less energy to build than comparable buildings from modern materials" - maybe so, what was that thing about building your house from sand? Don't you need the right kind of earth? i.e. clay content, etc. it'd be cooler than plaster. i wonder who can think up a mower for it though. The last tulou was built in 1960. It is made from rammed earth. The word 'tulou' means 'earthen castle'. I think the crunch lies here. Tulou building elements take time to make. You can substitute time with force. This has an energy cost implication. Same as baking bricks in the sun vs baking bricks in a kiln. You takes your clay you bakes your bricks. Scaling up, you bakes your bricks faster you inserts more energy. You want to stamp these out faster, add energy. Economies of scale should make energy input less per unit. Whether the end calculation, for rammed earth tulou's, is more energy efficient per unit is probably an open question, although the market may have already answered it for you. Incidentally, a chinese inventor was seeking standards bureau accreditation, in several countries, for this exact same "rammed earth" brick. He has succeeded in building small settlements within rural villages in Zambia. Will see if I can find a link. May have to adjust the english saying to: "He is built like a shitbrick house". UnaBubba, you seem to be an expert. Care to give an example of such modern tulou's? (Not the Yongding tourism center, because, yes, that one is built in brick - it's also the center specially built to promote tulou tourism in Fujian; and it's dead-ugly). I know of exactly one modern building 'inspired' by the tulou form [link], the building in Meizhou, widely covered by the press, but that's it. I've seen model pieces in an exhibition about tulou in Europe, yes. But an actual building? Never. That would have been frontpage news here. So I'd be highly interested in finding out more about these many examples you seem to know of, because this architecture fascinates me. I've found a really neat architectural site about tulous [link]. No reference to modern versions there, though. PS: there are not about 6000 of them; there are about 40,000 of them and they're confined to south western Fujian and southern Jiangxi. ...I'm reminded of an episode of The Office. [django] gets points for discovering this interesting method of construction and sharing it; after that, any displaying of knowledge just demonstrates the ability to google. "Round building erected, cabinet makers union outraged". I am going to use this device to build a castle out of my enemies! Muhahahah! I think I'll let it dry out for a while before moving in, though. communities that are displaced by volcanic eruptions can make something out of the mudflow to help them financially - i've already seen it done with lahar rooftiles, to make whole houses out of it would be special. //lahar rooftiles, to make whole houses out of it...// you are, I presume, aware that lahar is typically radioactive? [vincevincevince], why would i ask if something is ok for human housing if i knew it was radioactive? obviously, i didn't know. i don't ask questions or post ideas just for the drama that i might get out of it. This has given me a great idea: mildly radioactive mud mortar to control wall-dwelling reduviid bugs that carry Chagas disease. The house inhabitants would be little affected, as they are not generally in tight proximity to the mud mortar walls. The bugs are, and so would be mortally irradiated by high energy low penetrance particles. This same principle could apply to antifouling paint.